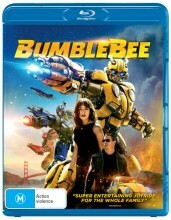 The Bumblebee Blu Ray sees him on the run in the year 1987 when he finds refuge in a junkyard in a small Californian beach town. Charlie, on the cusp of turning 18 and trying to find her place in the world, discovers Bumblebee, battle-scarred and broken. The Bumble bee Blu Ray stars Hailee Steinfeld, Martin Short and Pamela Adlon. Click the button below to add the Bumblebee (Blu Ray) to your wish list.